Jewel Prestage (1931–2014), first African-American woman to earn a Ph.D. in political science, former Dean of the School of Public Policy and Urban Affairs at Southern University. Sarah Jane Woodson Early, born Sarah Jane Woodson (November 15, 1825 – August 1907), was an American educator, black nationalist, temperance activist and author. A graduate of Oberlin College, she was hired at Wilberforce University in 1858 as the first black woman college instructor and she was the first black American to teach at an historically black college or university (HBCU). She also taught for many years in community schools. After marrying in 1868 and moving to Tennessee with her minister husband Jordan Winston Early, she was principal of schools in four cities. 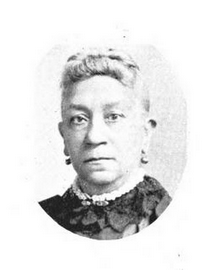 Early served as national superintendent (1888–1892) of the black division of the Women’s Christian Temperance Union (WCTU) and gave more than 100 lectures across five states. She wrote a biography of her husband and his rise from slavery that is included among postwar slave narratives. Sarah Jane Woodson, the fifth daughter and youngest child of eleven of Jemima (Riddle) and Thomas Woodson (1790–1879), was born free in Chillicothe, Ohio on November 15, 1825. Her parents had moved to the free state of Ohio about 1821 from Virginia, where they had gained freedom from slavery. They founded the first black Methodist church west of the Alleghenies. In 1830 the Woodsons were among the founders of a separate black farming community called Berlin Crossroads, since defunct. The nearly two dozen families by 1840 established their own school, stores and churches. Her father and some brothers became black nationalists, which influenced Sarah Woodson’s activities as an adult. Her father believed that he was the oldest son of Sally Hemings and President Thomas Jefferson; this tradition became part of the family’s oral history. According to professional historians, this was not supported by known historical evidence. In 1998 DNA testing of descendants of the Jefferson, Hemings and Woodson male lines showed conclusively that there was no match between the Jefferson and Woodson lines; the Woodson male line did show western European paternal ancestry. According to historians at Monticello, no documents support the claim that Woodson was Hemings’ first child, as he appeared to have been born before any known child of hers. Professional historians have ignored the erasure of the name of a male slave, who was born in 1790, whose named was recorded in Jefferson’s Farm Book by Thomas Jefferson and the survival of at least one letter of the name of the mother of the son in the Farm Book, as well. Thomas Woodson was born in 1790 and this time also matches the year of birth for the son named Tom attributed to Sally Hemings by newsman James Callender. In 1839 Sarah Woodson joined the African Methodist Episcopal Church (AME), founded in 1816 as the first independent black denomination in the United States. Her brothers, Lewis, Thomas, and John were ministers in the church. The Woodson family emphasized education for all their children. Sarah Jane and her older sister Hannah both attended Oberlin College; Sarah Jane completed the full program and graduated in 1856, among the first African-American women college graduates. On September 24, 1868, Woodson, then age 42, married the Reverend Jordan Winston Early, an AME minister who had risen from slavery. He was of mixed-race ancestry born in 1814 in Franklin County, Virginia. His mother died when he was three, and he was cared for by a maternal aunt and older woman in the slave community. His masters took their slaves with them as they moved to Missouri in 1826. There a Presbyterian minister taught him to read and write (although it was illegal for slaves). As a young man, Early was “hired out” by his master to work on steamboats on the Mississippi River, traveling between St. Louis and New Orleans. In 1832 Early joined the African Methodist Episcopal Church, the first independent black denomination in the United States. In 1836 he was licensed as an AME preacher and later ordained as a deacon and elder. He helped plant new congregations and in 1840 helped build the first AME Church in St. Louis. In 1843 he married Louisa Carter of that city. They had eight children, four of whom survived to adulthood. The Earlys sent their children to Wilberforce University. Louisa died in 1862. Sarah and Jordan Early had no children. Jordan Early retired from active minister appointments in 1888. Sarah Early helped her husband with his ministries, and also taught community schools. In total, she taught school for nearly four decades, as she believed education was critical for the advancement of the race. She served as principal of large schools in four cities as well. Sarah W. Early became increasingly active in the women’s temperance movement, one of numerous reform activities of the nineteenth century. In 1888 she was elected for a four-year term as national superintendent of the Colored Division of the Women’s Christian Temperance Union; during her tenure, Early traveled frequently and gave more than 100 speeches to groups throughout a five-state region.